I thought I was over talking about the Beatles for awhile, after spending Sunday fully submerged in Ed Sullivan Show anniversary madness, but today I read an oral history of another Beatles event celebrating its 50th anniversary: Their concert at the Washington Coliseum on February 11, 1964. The Washington Post published the story, which culled anecdotes from concertgoers, photographers, hotel managers and a former Beatle to create a delightful read, full of stories and insights I’d never known. There are so many stories bubbling under the surface of commonplace events, just waiting to boil over. Well, I guess the Beatles playing D.C. wasn’t necessarily “commonplace.” But it’s not one of the major moments that spring to mind when thinking about the Beatles in America – you spend those thoughts on the Ed Sullivan Show and Shea Stadium. I can just picture a dad pointing to the awesome new car in the driveway, shrugging and thanking the Beatles for a new car. I love how this captures the newness and thrill of America for the Beatles. “You went to New York for the first time? So did I.” Ringo could not have said anything more perfect. Liles’ story brings the spectacular train scene from A Hard Day’s Night to mind. America enthralled the Beatles, but they still knew what they were going to get. They were in on the joke, and they played along, giving us so many wonderful stories to remember in the process. In college, I did a really terrible job of reading for pleasure. After poring over tons of books and articles for class, reading more books didn’t seem like an appetizing way to spend my free time. I read plenty of magazine and news articles, but read very little in the way of actual, honest-to-God books. I did alright during summers, but after graduation, I decided it was time to step up my game, book-wise. Now, books are an escape, not a chore. While I’m trying to make up for lost time and read as many as I can, I don’t want everything to go in one ear (eye?) and out the other, so I’m writing little “debriefs” for everything I read this year. I’ve finished two books so far in 2013 (though the vast majority of the first was read in 2012), and here’s what they taught me. I blogged a little about this book as I was reading it, and now that I’m through, I wish I was taking some class that required me to write a whole research paper on it. As terrible of a student as this will make me sound, I took more notes on this book than I did on a lot of books I read in college. Reading it without an assignment hanging over me, I was able to take it at my own pace and soak it in as a whole, rather than thinking about bits and pieces that might somehow fit into a paper. It is a tremendous work: 754 dense pages about Abraham Lincoln, his four primary rivals in the race for the 1860 Republican nomination for president, his cabinet once he did become president, and how he worked with and maneuvered around all those people to lead the United States through the Civil War. First, Lincoln as storyteller: I wrote about this a couple months ago, when I had just started the book, but if you’ve seen Steven Spielberg’s movie Lincoln, whose screenplay is based on Team of Rivals, you probably laughed out loud at the story Lincoln tells about Ethan Allen seeing a portrait of George Washington hung in an outhouse. I know that story doesn’t make sense out of context for people who have not seen the film or read the book, but Daniel Day-Lewis’ timing and delivery of the story provided me with one of my favorite moments in any movie. Team of Rivals is full of references to Lincoln’s gift for storytelling, molded when he was a boy as he listened to his father tell stories to travelers and pioneers who spent the night in their Kentucky home. Then, Lincoln as a PR master. Honestly, the man was a public relations genius, especially when it came to the internal PR he had to conduct in order to keep all his cabinet members, friends, constituents and military leaders happy. In my eyes, though, his greatest PR gift was his ability gauge public sentiment, and wait until it was on his side before making proclamations or taking certain actions. This sensitivity to public sentiment was never clearer than when Lincoln was preparing to issue the Emancipation Proclamation. He waited until the North was ready to fight for the abolishment of slavery – not just for the preservation of the Union (p. 502). The same went for his proposition to let blacks enlist; he waited until public opinion was strong enough on his side, and likened the situation to a man waiting for pears to ripen. “A man watches his pear-tree, day after day, impatient for the ripening of the fruit. Let him attempt to force the process, and he may spoil both fruit and tree. But let him patiently wait, and the ripe pear at length falls into his lap (p. 502)!” He would act when the public was ready to willingly support his decisions, and not a moment sooner, avoiding personal embarrassment, and, worse, the failure of key measures like the Emancipation Proclamation that helped facilitate the war’s end. Finally, Lincoln and perception. As a young man, Lincoln took very little comfort in the idea of heaven or an afterlife as something to live for; in his eyes, this life was all he had, and he was obsessed with doing something great that would cause him to be remembered and celebrated in future generations. “Like the ancient Greeks,” Goodwin wrote, “Lincoln seemed to believe that ‘ideas of a person’s worth are tied to the way others, both contemporaries and future generations, perceive him'” (p. 100 of Team of Rivals, quoting William G. Thalmann’s The Odyssey: An Epic of Return). I have dozens of other Post-it Notes and highlighted paragraphs littering my copy of Team of Rivals, but those were the three elements of the book and Lincoln’s life that stuck to me. If you have any interest in American history, or just want to read a thoughtful, well-researched book, I cannot recommend it highly enough. It seems like this book was on everyone’s “Best of 2011” list, so I’m behind the curve, but I did read most of this during Christmas break of 2011 before abandoning it once classes picked up again. I must have read more than I remember, because I was probably three-quarters of the way through before I started hitting material I hadn’t already seen. I don’t think I liked it as much as I thought I would (or should) – I started out loving it, hated it (or at least found it a little tiresome) in the late-middle, but felt satisfied with the ending. Maybe that makes no sense, but hey, I’m not a professional book reviewer. Even if I didn’t like what some of the characters did at times (a large chunk of it just wore me out, because all five main characters more or less hit rock bottom at the same time; turn the page, another character makes a bad decision and starts some long journey back to reality), I loved the way they were developed. Each main character had a rich backstory that was described upfront and used as the foundation for his or her actions throughout the book. There were a lot of moving parts that all came together in the end, which was what I loved most about this book. My copy included a “Reading Group Guide” in the back, which featured a Q&A with the author. He likened weaving five stories together and leading them to a satisfying conclusion to completing “a humongous math problem.” Borrowing that analogy, finishing The Art of Fielding was like solving a complicated algebra problem, then checking your answer in the back of the book to find you actually did it right. On top of it all, Chad Harbach is a gifted writer. The book is smooth. His characters talk and think like normal people talk and think, and he describes their actions in a way that allows you to picture how they are moving. If I ever write a debut novel someday, I’d hope it’s as well-written as Chad Harbach’s. 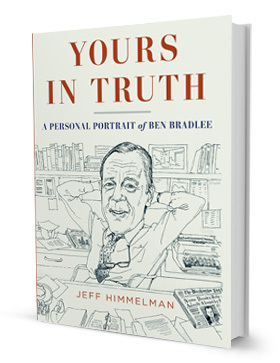 Book Three of 2013 is Yours in Truth: A Personal Portrait of Ben Bradlee, by Jeff Himmelman. Most of what I know about Ben Bradlee is shaped by Jason Robards’ portrayal of him in All the President’s Men, but I’m about a third of the way through this book, and already my perspective has shifted dramatically. Bradlee seems to be the personality of all personalities, and it’s a pleasure getting to know him. More to come. I certainly don’t want to step into the complicated web of “how do we remember Joe Paterno,” but the news of his death – unfounded last night, confirmed this morning – taught me a valuable lesson about the importance of thinking before you write or tweet. I truly learned of Paterno’s death this morning, when a New York Times notification popped up on my phone, but the story really began yesterday. Mid-afternoon, as I opened Twitter on my phone to tweet about the Oregon basketball win, I was shocked to see so many tweets about how Paterno’s family had been summoned to State College to say their final goodbyes. I hadn’t been following the story, or Paterno’s health, much since the news died down later in November, but I certainly didn’t know that his condition was so bad. Last week, I read the story from Sally Jenkins’ interview with Paterno – the first, and now last time he’d spoken since the scandal – but that was the most I’d read in weeks. Yesterday evening, as I had TweetDeck open while watching TV, the tweets announcing Paterno’s death started to flood in. I wish I could remember where I first saw the news (I don’t follow @OnwardState, a student-run Penn State news outlet, which first tweeted that he had died), but within seconds my Twitter stream was filled with re-tweets of a CBSSports.com story which also claimed Paterno had passed. It was a confusing few minutes, but as consensus was reached that the news was false, several writers started offering journalism advice and perspective on the situation. I didn’t perceive it as intentionally critical – most said something to the effect of “we all make mistakes” – but the sports fan’s relationship with Twitter, which is often “say something as dramatic and witty as possible as fast as you can” probably took precedence over what should have been objective, fact-based information sharing. I’m as guilty as anyone here. I quickly re-tweeted someone who offered a brief “RIP JoePa/thoughts and prayers with the family” tweet. I re-tweeted another tweet which expressed sympathy for Joe Posnanski, the writer who was in the midst of a Paterno biography when all the scandal erupted. The specific journalism lesson was “don’t run with it until the Associated Press reports it.” As the Poynter article points out, the AP wisely held off until they were absolutely sure Paterno had or had not died. They never reported false information, and look all the better for it today. More generally, however, I learned a lesson regarding my responsibility, as an individual Twitter user, to dig into a story and make sure it’s correct before I hit the re-tweet button. Twitter gives all of us – whether we’re paid to write about sports by a major media company or hacking away at our laptops on a college campus – the power to be our own media outlet. Usually, that’s awesome: We can say (or tweet) whatever we want, whether it’s rumors we heard from a friend, comments on a controversial column, or re-tweets of a solid piece of journalism. Wherever we set our computers or pull out our phones, we’ve constructed a mini press box. Of course, my neck’s not on the line because I re-tweeted false news of Paterno’s death. But I learned a valuable lesson about the importance of double-checking and making sure your news is coming from a confirmed source. Twitter is the place to be if you’re a sports fan. News, opinion, commentary and banter thrive there every day, but if users – even those who aren’t paid to get the story right – are blindly re-tweeting and taking everything a major outlet says as fact (“If CBS Sports said it, it must be true”), the value is lost. It can be hard to remember in the heat of the moment. Every element of this story is magnified because of the circumstances under which it unraveled, but emotion can’t obstruct the facts, whether we’re a respected reporter or passionate fan. Clay Travis of the blog Outkick the Coverage came down hard on CBS and its lack of responsibility in reporting. He points out (probably correctly) that had ESPN (which doesn’t have the greatest reputation among sports fans on Twitter) first reported the false news, Twitter would have filled with outrage. CBS, which has terrific college football coverage, looks bad in light of last night, but they definitely aren’t garnering the hate ESPN would have received. …as did Kelly Whiteside of USA Today.